When I test and review a handgun it must stand on its own merits. No matter the reputation of the company, a new model is treated as an upstart. Just the same prior experience and the company’s proven long suits mean a lot. Some years ago when the Kahr 9mm pistol was introduced, I obtained and tested an example as soon as possible. I found a reliable handgun with excellent features. A smooth double-action-only trigger, excellent machine work, and a truly compact frame made for a trend setting pistol. The design was fresh and intelligent. The pistol featured an angled feed ramp that made for a more compact handgun and more room in the frame to accommodate the trigger action. I remember writing that Kahr had shown the world Gun Valley could equal the Europeans. I still feel that way. 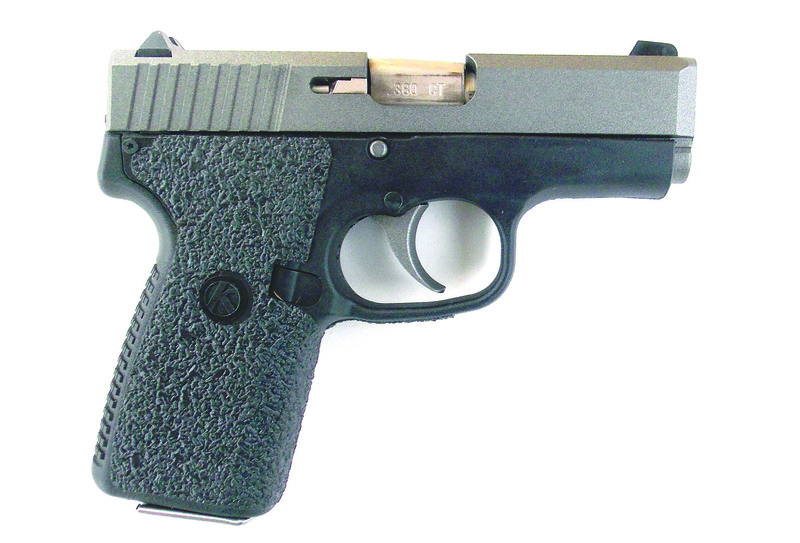 Kahr has expanded the line to .40 and .45 caliber handguns and different slide lengths. They moved seamlessly into the polymer frame world as well. 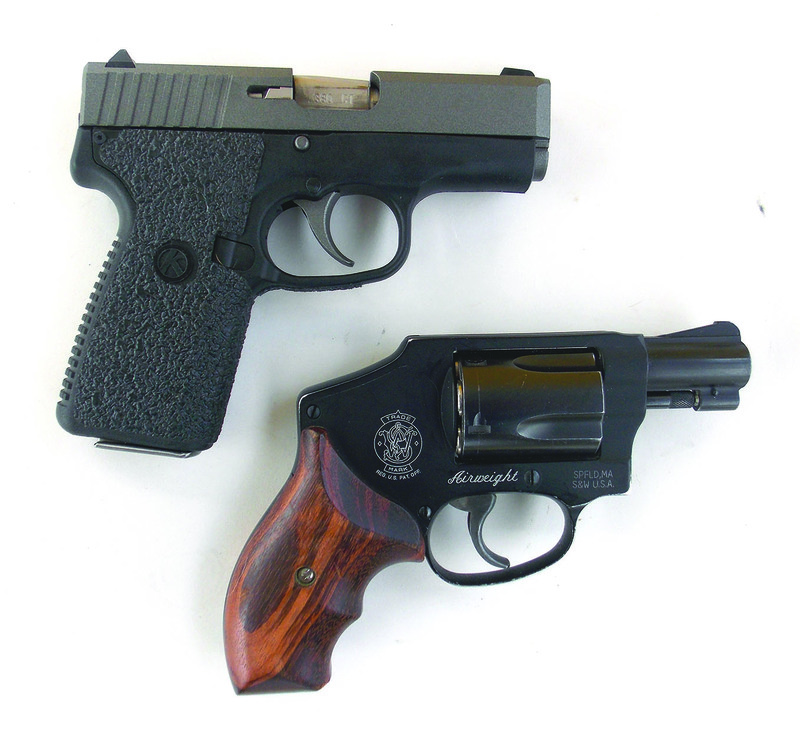 A few years ago Kahr introduced the .380 ACP series pistols. These little guns, like the other Kahr handguns, shoot better than they should considering their size. My personal version features a tungsten finished slide, polymer frame, and excellent all around workmanship. A bold front post sight allows rapid sight acquisition. The original pistol featured a six-round magazine and short grip. It is truly compact, but I like the newer seven-shot magazine and longer grip better. While the standard pistol is certainly concealable, I like the CT380 Tungsten Packed version for my personal use. With a 2.5-inch barrel, this piece tips the scales at less than eleven ounces. The taller grip frame helps me with hand fit, but don’t let me discourage you from choosing the smaller piece for pocket carry. It just may be the ideal grip for your personal use. The intrinsic accuracy of the shorter grip pistol is the same as the larger pistol; it is practical accuracy that matters. The grip frame is textured for a solid grip. Adhesion and abrasion are ideal. I like the pebble grain finish. The rear grip strap is slightly arched and features serrations along the surface. The trigger surface is smooth, ideal for a carry gun. The sights are well designed for close-quarter battle. Rather than the more common three-dot pattern, the Kahr sights feature the white bar front and bar rear known as the BAR-DOT. For accurate fire they work well. The front dot is the primary aiming point for fast work. 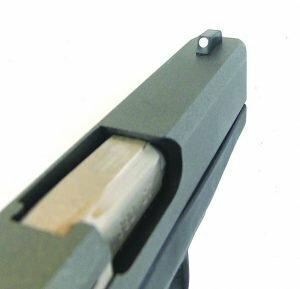 For more accurate shooting the bar is carefully aligned under the front dot. 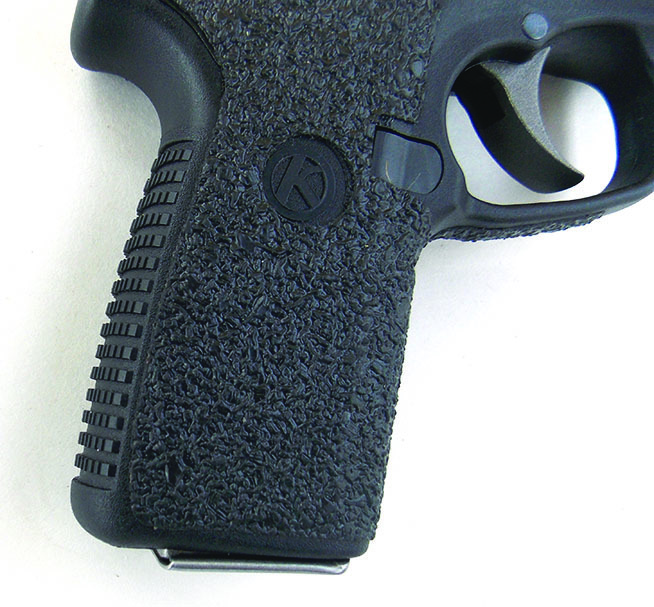 Both adhesion and abrasion are good with the Kahr’s well designed grip. The sights are well regulated for 90- and 95-grain loads. My primary concern with any handgun is reliability. The pistol must feed well. Hand fit is important but firing performance most important. Secondary concerns include recoil control, accuracy, and maintenance requirements. As of this writing I am getting close to 500 rounds fired in the Kahr, a goodly amount for a pocket pistol. These cartridges were pleasant to fire and there have been no malfunctions of any type. These loads have included most of the major maker’s jacked hollow point ammunition and ball ammunition as well. I have concentrated my work during the first outing on humanoid-sized targets at no more than 7 yards, firing with the one hand point and from retention position. The Kahr ate everything fed into the two supplied magazines. The pistol comes on target quickly. The sights are good and the trigger is very smooth. Recoil is modest, largely due to the grip design. While the .380 ACP cartridge isn’t a powerhouse, this is a light handgun and you must affirm the grip to control the piece. The Kahr was actually a fun gun to fire. It is accurate enough to engage small targets to 15 yards or so. A pistol that is enjoyable to fire and accurate will be fired more often. The sights are well regulated for 90- to 95-grain loads. I have taken the pistol to the range on several occasions and practically exhausted my cache of .380 ACP ammunition. The pistol is clearly reliable. I have fired the pistol for accuracy, offhand, at ten yards, firing seven rounds as quickly as I could regain the sights after trigger reset. On several occasions I have fired a seven-shot, 4-inch group. 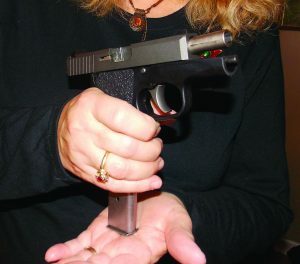 At the typical personal defense range of seven yards the pistol will put the entire magazine into one hole in the hands of someone that has practiced. The pistol is reliable, accurate and seems to have low maintenance demands as it was not lubricated save just before the initial evaluation. The Kahr must be loaded properly for good function. Lock the slide to the rear and release to load. A caution that applies to all Kahr pistols―when loading lock the slide to the rear, insert a loaded magazine, and drop the slide to properly set the trigger. If you insert a loaded magazine and rack the slide the trigger may not reset properly. This seems a top flight handgun. For pocket carry with a .380 ACP handgun this pistol would be at the top of the list. There are a number of loadings available for the .380 ACP. Some make claims of velocity that just isn’t possible with the small .380 ACP cartridge. All self-loading handguns work within a certain pressure range and a certain range of power for cycle reliability. I would avoid the frangible loads designed to break up on contact with the body. They do not have the necessary penetration for good wound potential. I prefer makers with a proven record for producing reliable ammunition. Hornady offers the 90-grain XTP at 930 fps. This is a reliable loading that offers good penetration and expansion. 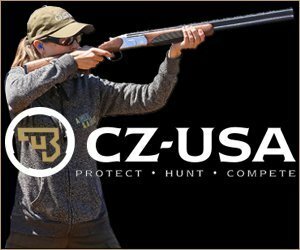 Black Hills Ammunition offers a quality loading that also uses the XTP bullet. They also offer a solid copper bullet in the Honey Badger line. This load ensures good penetration. Fiocchi offers a loading that also uses the XTP bullet as well as quality full metal jacketed practice ammunition. Gorilla Ammunition offers a 95-grain JHP all copper bullet. These loads offer a good balance of penetration and expansion. In the end shot placement matters the most. The Kahr .380 is a fine choice as .380 ACP pistols are concerned.